The news that you have high cholesterol puts you at a greater risk of heart disease, but this diagnosis is possible to reverse. Through diet and exercise, you may lower your cholesterol to a safe level. Familiarizing yourself with the cholesterol level of various red meats, including lamb, helps you make health-conscious choices before meals. The cholesterol level of lamb versus other red meats is similar, although the cut of each meat dictates its nutritional value. 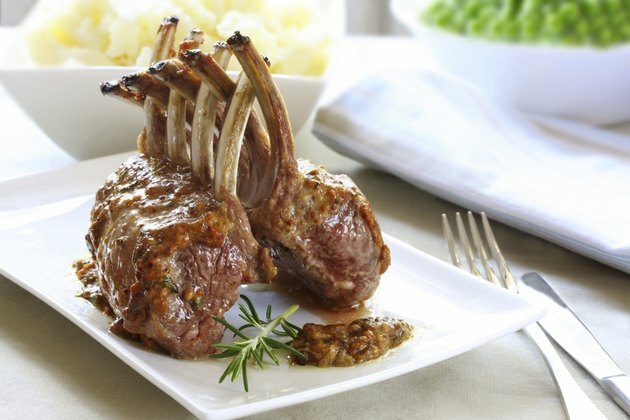 Per ounce, boneless lamb chops, trimmed to 1/8-inch fat, have 19 milligrams of cholesterol. When broiled, an ounce of ground lamb has 27 milligrams of cholesterol. As a comparison, an ounce of broiled, 80 percent lean ground beef has 26 milligrams of cholesterol and an ounce of grilled T-bone streak, trimmed to 1/8-inch fat, has 24 milligrams of cholesterol. Per ounce, roasted pork tenderloin has 21 milligrams of cholesterol and 84 percent lean ground pork has 19 milligrams of cholesterol. What Should My Cholesterol Levels Be at Age 29?